Over the next few weeks we’ll be running a series of interviews with past GMAT takers and MBA graduates. All of the interviewees are from different backgrounds and are using their MBA’s on different paths. Today’s interview is with start up employee Tracy Zeidler! Kellogg School of Management from 2007-2008; I graduated from the one year MBA program. Current Position: Marketing & Operations. GMAT test taking experience: Dedicated self studying for just over a month. Best and worse things about business school? The best things about business school for me were the amazing opportunities constantly available. This was everything from the speakers, class projects for real companies, travel opportunities, and interacting with and forming friendships with people from all over the world. The worst thing, and hardest thing to get used to, was giving up a paycheck – and having to pay tuition, of course! You traveled abroad during your MBA. What did you learn from these experiences? Was there an extra cost associated with this? 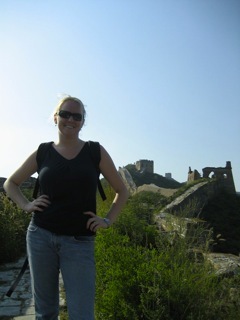 I was fortunate enough to travel to three places while at Kellogg – China, Russia and Nicaragua. There was an extra cost associated with all three but I did get to take advantage of group discounts so it was definitely cheaper than traveling alone. The China trip was through a program called KWEST, where second year students plan, schedule, budget, book and lead trips for first year students. As the trip take place very early in the school year, a main goal is to introduce first year students to fellow classmates they may not otherwise meet while at Kellogg. The trip also involves both sight-seeing and service opportunities and was an amazing experience. My trip to Russia was for a student-run class I took called Global Initiatives in Management (GIM). There are several class/country options to choose from – I chose Russia because I figured it was a place I’d likely not travel to on my own, yet I found to be a fascinating country and political and business environment. We studied all aspects of Russia for our winter quarter including the government, politics, natural resources, the business environment, corruption, etc. and then traveled as a class to Russia for two weeks. While in Russia, we did a lot of sight-seeing as well as met with government and business leaders including a trip to the US Embassy, Cartier, Wrigley, McDonald’s and others. My trip to Nicaragua was through a program called Kellogg Corps where I completed a consulting project for a non-profit organization. I learned more about household paint than I ever thought possible – the non-profit I worked with has several for-profit businesses used as a means to fund their non-profit activities, as well as provide skills training and employment for Nicaraguans. The project I worked on was a marketing strategy for a business that buys paint for pennies on the dollar in the U.S., transports it to Nicaragua, mixes and re-formulates, and then sells to the Nicaraguan marketplace. Outside of the work of paint, I learned a ton about the people and culture of Nicaragua and had many amazing experiences. I also got to practice my Spanish skills outside the classroom, once even to “bribe” a police officer to let my husband out of a ticket. How did you find your job? Through Kellogg’s Career Management Center’s job board, available to Kellogg students and alumni. You seem to love your job and the start up you work for sounds fantastic! Tell us a little about the company and your position there. I work for MightyNest, an E-Commerce start-up that is a year and a half old. MightyNest.com is an online store and resource center dedicated to making it quick and easy for parents to find and learn about healthy, safe, non-toxic products that create a healthier home for their families. When I joined I was the only employee (besides the founders, a husband and wife team, who both worked part time) and as such, my role consisted of doing everything from inventory management, accounting, marketing, customer service and even shipping. A year and a half later we have someone who does all of our shipping, someone who manages our inventory and forecasting. So now I get to focus on marketing, building brand awareness and helping design the overall strategy and vision for the company. It has been amazing to be such an integral part helping to build a company from the ground-up. I can’t wait to see where we’ll be in the next 1.5 years! So, business school, was it worth the time and money spent investing in yourself? Definitely. After spending 5 years in consulting traveling 3-5 days a week non-stop I knew I wanted a change, but wasn’t exactly sure what that change was. Getting my MBA was something I had always planned to do and I’m glad I did. Business school gave me a chance to expand my knowledge and interests as well as explore subject matters that I probably would not have had access to in my consulting career such as International Business in Non-Market Environments and Advertising Strategy. Going back to school really helped me hone my interests and skills and helped me figure out where I wanted to go next with my career.